In their six years of marriage, Elizabeth and Darcy have forged a peaceful, happy life for their family at Pemberley, Darcy’s impressive estate. Her father is a regular visitor; her sister Jane and her husband, Bingley, live nearby; the marriage prospects for Darcy’s sister, Georgiana, are favorable. And preparations for their annual autumn ball are proceeding apace. But on the eve of the ball, chaos descends. Lydia Wickham, Elizabeth’s disgraced sister who, with her husband, has been barred from the estate, arrives in a hysterical state—shrieking that Wickham has been murdered. Plunged into frightening mystery and a lurid murder trial, the lives of Pemberley’s owners and servants alike may never be the same. P. D. James was the author of twenty books, many of which feature her detective hero Adam Dalgliesh and have been televised or filmed. She was the recipient of many honors, including the Mystery Writers of America Grand Master Award and the National Arts Club Medal of Honor for Literature, and in 1991 was created Baroness James of Holland Park. She died in 2014. James has provided many links in the introductory chapters that provide both the backstory of and continuity with Pride and Prejudice. How successful is the bridge that she creates? The night before the ball, the howling wind and the turbulence of nature are contrasted with the comforts within the house. Elizabeth is experiencing “an emotion which she had never known before,” a worry about “a world in which men are as violent and destructive as is the animal world” (48). What does her fear mean for the growing family at Pemberley, and how does it relate to the violent events of the story? Colonel Fitzwilliam, Darcy’s cousin, wants to marry Darcy’s sister, Georgiana. But Georgiana seems to be in love with the young lawyer, Henry Alveston, whom Elizabeth calls “a paradigm of a young man” (35). Why doesn’t Elizabeth trust the colonel? What details or events raise doubts about his character, which had been so dependable in Pride and Prejudice? What do you think of James’s re-creation of Austen’s characters, particularly Elizabeth and Darcy? How are they changed, and how are they similar to the originals? Darcy thinks often of the burden of responsibility to his estate and the family name. From boyhood he had sympathized with his great-grandfather, who gave up his title and went to live in the woodland cottage with his dog (63). How does Darcy’s great-grandfather’s rejection of his social position resonate in Death Comes to Pemberley? Do Darcy’s feelings about George Wickham suggest that he feels somewhat guilty about the privileges he has inherited (64, 199-200)? The extensive woodland on Darcy’s estate, with its “torn and hanging twigs,” its “tangled bushes,” and its confusion, presents a strong contrast to the order and rationality of the household and the cultivated grounds (67). What might P. D. James be suggesting about Elizabeth and Darcy’s world by giving the woodland such a strong presence in the novel? Elizabeth is embarrassed by the fact that she once found Wickham so attractive that “she had been...close to falling in love with him” (90). Does what we see of Elizabeth and Darcy’s marriage indicate that Elizabeth has become a less teasing, witty, and playful person than she was in Pride and Prejudice? If so, why might this be? When Alveston speaks up on behalf of Georgiana’s ability to be present during the investigation, he mentions Mary Wollstonecraft, mother of Frankenstein author Mary Shelley, and most famously the author of A Vindication of the Rights of Woman, an eighteenth-century feminist treatise (125). What kinds of ideas does Alveston represent? Would his marriage to Georgiana be a more “modern” one than that of Darcy and Elizabeth? How do the investigation and the prosecution shown in the novel differ from what we see in the modern police procedurals that P. D. James usually writes? Does Wickham receive a fair trial? Why or why not? Consider, too, the reference to the young man who was executed after being found poaching on the estate (42). Why does James include this detail in the story? The scene in which Bidwell is polishing the silver for the ball introduces the reader to the servants’ private lives and their difficulties (41-45). What do you think of the way the secrets of the Bidwell family are eventually revealed? Does Wickham’s affair with Louisa come as a surprise? Does anyone among the servant families seem to be capable of the violent blows that killed Captain Denny? How do you judge the character of Wickham, given the further development provided by P. D. James? Is he sympathetic? Is he careless and narcissistic? Do you agree with the Reverend Cornbinder that he is capable of remaking himself in America (257-58, 261-62)? Wickham is about to be condemned to death when two surprising things happen: Mrs. Younge rushes from the courtroom and is crushed under the wheels of a coach, and a letter of confession arrives from William Bidwell (235, 238). What do you think of these sudden plot twists? Darcy is deeply affected by the murder on his estate. Why does it shake his sense of identity and his earldom (109)? How does the story Wickham tells about his romance with Louisa, and the motivations surrounding it, make the troubled relationship between Darcy and Wickham more clear? Why is Lydia entirely absent from the story that Wickham tells (265-74)? 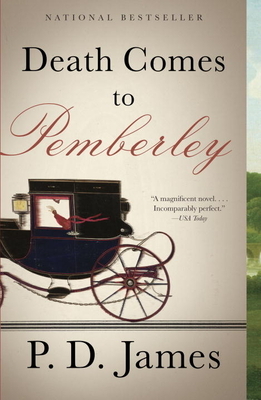 According to P. D. James, every mystery requires “facts which are hidden from the reader but which he or she should be able to discover by logical deduction from clues inserted in the novel with deceptive cunning but essential fairness” (from her autobiography, A Time to Be in Earnest, pp. 243-44). The “fairness” lies in the author’s giving the reader what is needed to solve the mystery. Were you able to guess or deduce who the killer was? If so, at what point, and on what grounds? What do you think of Louisa’s resolution to marry Joseph Billings and live at Highmarten, as well as the adoption of baby Georgie by Mrs. Martin (280)? Does this seem like a good outcome for them? James has some fun including references to other Jane Austen novels. Did you identify the references to Emma and Persuasion? In the “Author’s Note” that precedes the novel, P. D. James writes “an apology to the shade of Jane Austen for involving her beloved Elizabeth in the trauma of a murder investigation” and adds “had she wished to dwell on such odious subjects, she would have written this story herself, and done it better” (ix). Which aspects of this novel might Jane Austen have liked, and which aspects might she not have liked? P. D. James has invented a satisfying new episode in the life of Elizabeth’s troublesome sister Lydia and her ill-chosen husband. What further episodes would you and your group members come up with, if you were to write a sequel to Pride and Prejudice?